Dogland Dogs are only available at Dogland Park, or though Dogland Dogs Vendors. They are at Dogland as are their older cousins D&D Dogs. 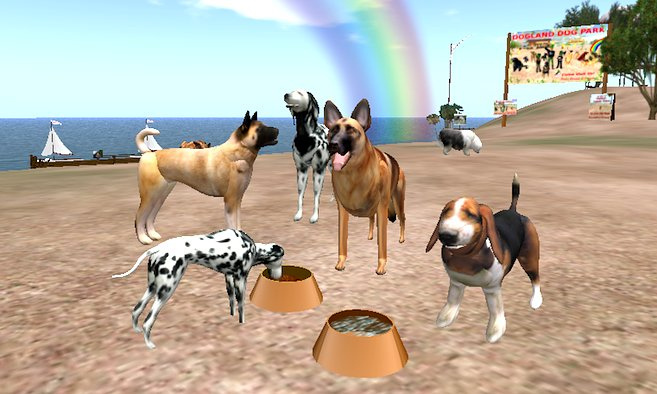 D&D Dogs is SL's original interactive Virtual Dog. Driftwood Nomad & Darrly Chang are the creators of D&D Dogs, and have a history that goes back to 2003 in the area of SL Dogs. These guys are my friends, and they taught me the first lessons that I learned about SL and Virtual Dogs. D&D Dogs will live at Dogland permanantly. Thanks Drift, and Darrly, for a good start in SL! Dogland Enterprises Has 3 Lines of "Dogland Dog"
All have the same great look, and body. These function on an advanced drop down menu. *The dog is L$600 - accessible for any budget. *The dog is simple to operate, even to new residents. *The menu give options for sound, wander, random, lay down, sit, follow, attack, stay, set home, go home, name, access, and a unique "kill" button to stop all activity. *There is a control choice. Touch "control" , and you can steer the dog using keyboard arrows for precision movement. *The dog can be worn (attached) without having to edit. This will allow tp and flight with dog, as well as walking in no build areas. When you walk, their legs will move, and when you stop, they will stop. *The dogs can be petted. Dogland Guide Dogs, is a support service for visually/perceptually impaired residents that want a Guide Dog, with a custom look. These dogs are not meant in any way to duplicate the functions that the VHH/VAI Guidedog "Max" can provide. The Dogland Guide Dog, can do basic guide dog functions, like find, follow, and tp you to coordinates. Our basic guide dog, can also give a free copy of "Max" , the VHH/VAI Guidedog v.2.9 to any friend you wish, through chat command. I fully support the "Max" project, and that is why the Dogland Guidedog is able to pass a Guidedog v.2.9, that has all functions to you, or to any friend you like. Dogland Guide Dogs are not for sale. Dogland Dogs will custom make a Guide Dog for any visually impaired resident of SL. Qualified recipients will be asked to send a full perm copy of their body shape(NOT SKIN) to Vitolo Rossini, so the dog can be custom fit prior to sending out. There are a number of fine looking breeds to choose from. Dogland Park has a long standing reputation for not charging for goods or services. The resale of preowned dogs of different types at reduced costs is another service of Dogland. We are fortunate to have wonderful supporters. There is no charge for the making of a custom Dogland Guide Dog, for residents that are visually or perceptually impaired. This Guide Dog, is in no way meant to replace "Max" or to interfere with the "Max" project by VHH and VAI. These Custom Guide Dogs are not transferable, and are good only for the person they are made for. There are two options for your Guide Dog. 1- Get an unscripted Custom Guide Dog, with instructions on how to install your "Max" contents into him (or have us do that for you). Basic Dogland Guide Dog is a simpler choice. They do not have pre-installed landmarks, voice or "tour" information, that "Max" does. Your Guide Dog can give any friend you choose, a copy of the "Max" Guidedog v.2.9 distributed as a free assistive device in SL. The Custom Dogland Guide Dog, will be given with the understanding, that the recipient will disclose to any that may ask, that this is not a Guide Dog distributed by VHH/VAI, and that the dog that you offer them , is the original "Max", with all features provided by VHH/VAI. The notecard that the dog is able to give you takes you through all features. Contact Vitolo Rossini with questions. This sled dog is pulled by Dogland Dogs! We have made special scripting so that you can ride in style with your choice of breed from the selection of Dogland Dogs. Each dog from tiny to large fits perfectly into his harness. You just rez and ride! Funtastic animations make you ride like a sledding champion. The whole while your dogs legs move when he runs, and stop when you stop the sled, with perfect timing! They are transferable, so they make a great gift! Brought to you by Dogland Enterprises, at L$150 - a great Dogfather price! Linden Labs has Dogland listed on their Destination Guide! Arf! Arf! Come check out the adorable lil' rascals here at Dogland Dog Park. You'll be tempted to choose your favorite pet. These frisky critters are pet-able and perfectly cute. Play with the pups or buy your own.